While this is a simple dish, it packs a ton of great flavor and nutrition. 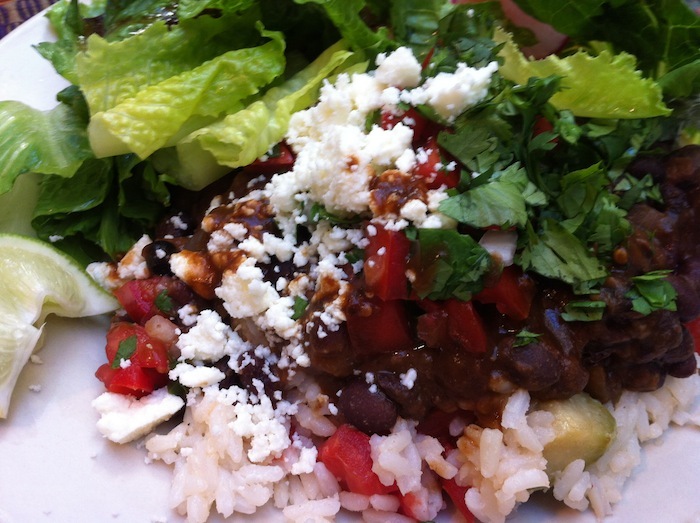 Beans and rice make a complete protein, meaning you get all of the essential amino acids that your body needs. It’s great on its own or topped with a variety of tasty options, like cheese, pico de gallo, avocado, sour cream, cilantro, hot sauce… Served with a side salad or some sautéed veggies and you’ve got a filling, delicious vegetarian meal, and it’s cheap too! Heat oil in a medium pot over medium-high heat. Add onion and cook until translucent. Stir in the garlic, tomato paste and bay leaves, cooking until garlic is fragrant, about a minute. Add the beans, smashing about 1/2 of them with the back of your spatula. Add the liquid, chili powder and cumin. Simmer for about 30 minutes, until the liquid is mostly absorbed. Season to taste with salt and pepper. Serve with a squeeze of lime juice and a sprinkle of chopped fresh cilantro. For the rice, you can just cook according the instructions on the bag. I stirred in some sautéed onion and chayote (similar in flavor to summer squash), and fresh chopped Roma tomatoes (remove the seeds), to the cooked rice the first time I made this, but it’s delicious either way. Brown rice is also a good option.